Friday April 30th 1926 Wrote to LeGrand and then went to see Warner. Found Mabel there and we came away together. I slept awhile in afternoon. Mr Jurekin and Miss Cowens had dinner with me. Lizzie Felkner came later. Saturday May 1st 1926 Wrote notes to Mrs MacBride, Roxie Robaneau and Lizzie Lindley. Then went to see Warner to say good-bye. Stopped at Seth Harts office. Mattie came soon after lunch and later Mary Holson. I packed my trunk and sent to the depot. Went down to get it checked and my ticket fixed. The girls had dinner with me. I sent air mail letters to Hattie and Joe Williams. Went to bed early. 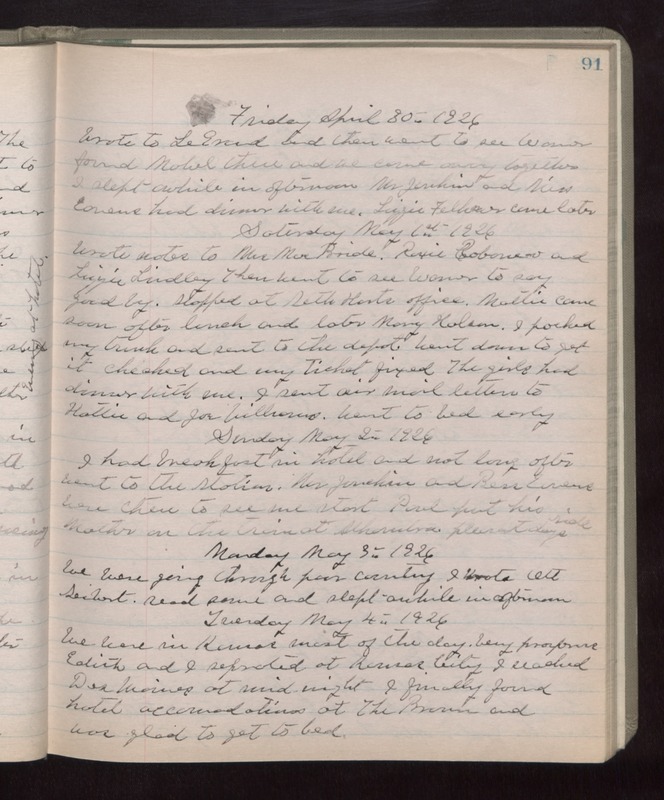 Sunday May 2nd 1926 I had breakfast in hotel and not long after went to the station. Mr Junekin and Bess Givens were there to see me start. Paul put his Mother on the train at Alhambra. Pleasant days ride. Monday May 3rd 1926 We were going through poor country. I wrote Ott Seibert. Read some and slept awhile in afternoon. Tuesday May 4th 1926 We were in Kansas most of the day. Very prosperous. Edith and I separated at Kansas City. I reached Des Moines at mid-night. I finally found hotel accommodations at The Brown and was glad to get to bed.